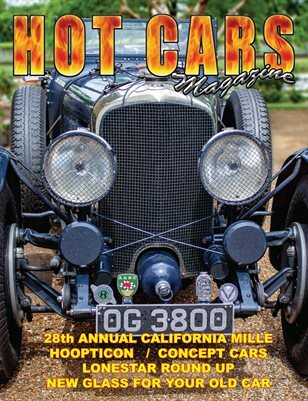 In this issue we have three great events to enjoy: 1) HooptiCon from Sonoma Raceway; a wacky weekend of weird car shows and the 24 Hours of Lemons! 2) The Lonestar Round Up from Texas; Shane Garletts brings us some great photos of vintage hot rods and customs; and 3) The California Mille; Northern California’s best vintage car rally! In addition, we take a look at some very interesting and unique concept cars from last summer’s Motor Week on the Monterey Peninsula, and our project car “BOB” gets all new safety glass installed. Very interesting issue to explore!